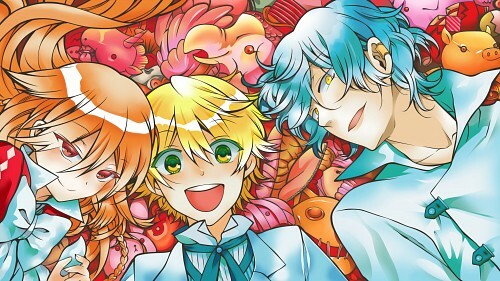 Pandora Hearts Wallpaper: TOYS-Let's play everyday! Minitokyo »	Pandora Hearts Wallpapers » Pandora Hearts Wallpaper: TOYS-Let's play everyday! In the last time I wasn't so active, because of hard studying V_V Now I am sick of studiyng XD and wanna do something funny. Just I wanted to vectoring something simple and try to use a new vectoring technique. I chose this SCAN because of the beautiful pastel colors. I thought, It will be simple and fast to make a vector wallpaper of it, but I haven't see that the coloring will be a problem. I never have done a coloring like .....watercolors? xD I was very afraid of it, but I think the result could be acceptable ^^ At the end it was funny too. This is very nice! The colours are wonderful, Gil seems to be shaped with water! Such cute colors! It's lovely! Thanks for sharing! back to the wall --- hmmm they looked like yummy candies when full-viewed. But well, indeed its an eye-candy to me. Just YUM YUM! fabulous piece there kiya. ;) For me everything is fine. Nothing much to be added. Its already amazing how simple it was but really stunning. Very good job! Really beautiful vector wall. I love your coloring too. Wow. You've vectored it so pretty and background looks detailed. Colors are also very pretty. nice wallie, i love it. Really amazing wall! Fav for me... as often! so colorful item to me. Wow, great work! The thumbnail really stood out because of all the bright and bubbly colors, and the full-view just justifies how good this is! This is so cute! The colors drew my attention instantly - I normally don't like PH artwork because the colors look too washed-out for me. But the colored outlines look great and I like that you used gray instead of pure black <3 Aside from the colors, the vectoring is also very clean and this makes for a great desktop! I would call the result more colouring-marker-ish than pastel-ly; it's very 'flash' and sharp. But then I don't think you can achieve the latter with vectoring; as far as that goes it is brilliant. Color is bright and flash. I love the colores veary good.